If there’s one thing that Genesis Alpha One has taught me, it’s that I need a CRISPR kit. I also need a wealth of genetic material from a variety of sources, including material from stowaways that happen to come onto my spaceship and start laying eggs and god knows what else, clogging the whole damn thing up. Maybe I need a bit of bug spray too. Okay, Genesis Alpha One has taught me a few things. It’s far from some genetic modification and horrible space creatures you face up to. Your space ship is designed by you from the very top to the bottom. Since that’s the case, hopefully, you’re decent at architecture and a bit of interior decoration too. Me? Not so much. My ships tend to look like a more awkward version of the maze from Maze Runner that have made some bad life decisions on the way. If you asked me to pick one thing that intrigued me the most about Genesis Alpha One, I’d tell you that I can’t. Radiation Blue have made a game that instinctively appeals to a number of my interests. First, there is the development and running of your very own spaceship as you travel through the reaches of space. Building up your own spaceship is one of the most interesting and challenging aspects of the game because of exactly how much you have to work around. As can be expected with a spaceship, space is a major constraint. The crew needs a place to live, their own quarters, and each crew quarters you place down occupies a maximum of five crew members. These people, aliens, hybrids – whatever they eventually are – also have requirements. The selfish buggers need to breathe, though what they breathe is also varied, and they also like a bit of leisure time. For leisure, you have options like a lounge, bar or cantina that you can build. For breathing, that’s a little different. The Greenhouse allows you to supply breathable air for the ship in limited quantity. this is determined specifically by the plants that you… plant. As your crew count increases, you’ll also need to increase the amount of air provided by the greenhouse, or greenhouses as it will eventually be. The plants, which you obtain from expeditions, provide a variety of breathable elements, from the standard Oxygen used by humans, to other elements like Nitrogen, Hydrogen and more. Naturally, building these sections of your ship, and the myriad of others, all require resources. Some of these are, understandably, rarer than others and more difficult to obtain. As well as that, you also have power constraints to consider. Each section uses a certain amount of power, which is supplied by generators that are an absolute pain to build, due to them needing Copper, which I can never seem to find. If only I could get some shipped over from Earth. The way you get these resources, as well as the genetic materials you’ll be using when creating your vat-grown crew, comes from two core methods. First is using your tractor beam to draw in loose materials scattered across the galaxy. When you do this, you get the refined materials which can instantly be used in crafting and building. The other way is to actually land on a planet with an expedition team sent from your hanger – should you have built one, which you will do as soon as possible. 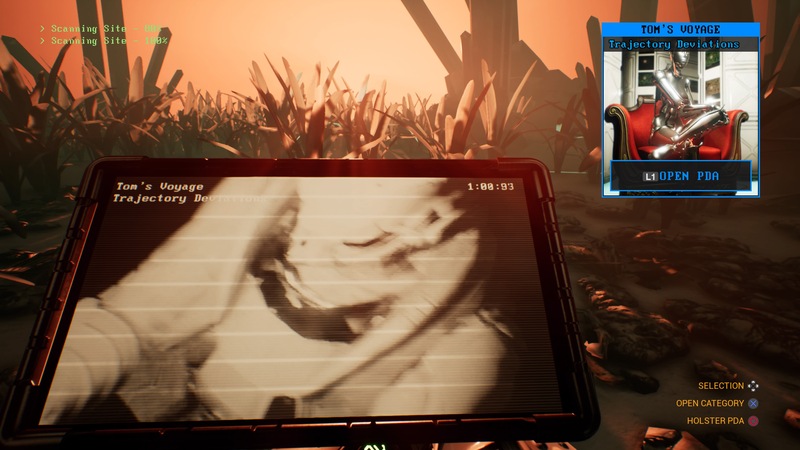 With these expeditions, you can either send two AI controlled clones that you’ve assigned to the hanger, or you even have the ability to go yourself – something I didn’t get to see during my preview of the game nearly one and a half years ago. Landing on the planet, you’ll have a bit of security from a turret on the top of your ship, but that’ll do little to protect you on what is ranked as more dangerous planets. More than likely, if you don’t set up your own perimeter using shields and turrets, you’ll find yourself quickly overwhelmed and then dead. Partly this is because of the limited ammo you can carry, but also the fragility of your character. As you play, you control one of your clones. 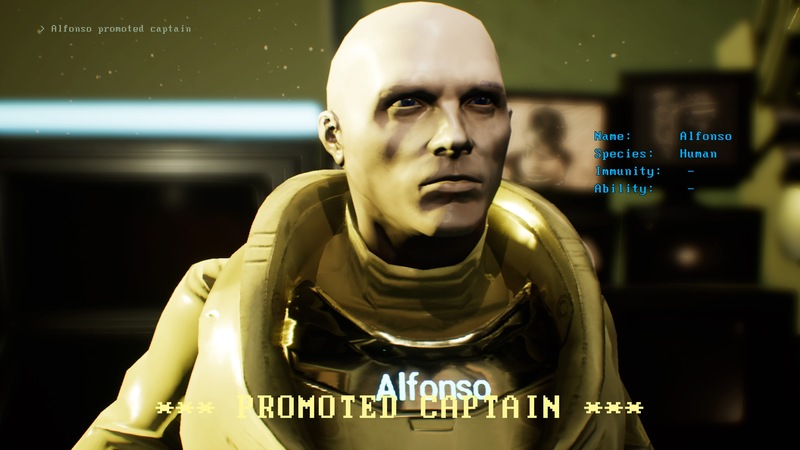 If you die and you haven’t set up the part of the ship that lets you hand-pick the captains’ successor, the game randomly drops you into one of the other clones. You don’t lose until everybody is dead. 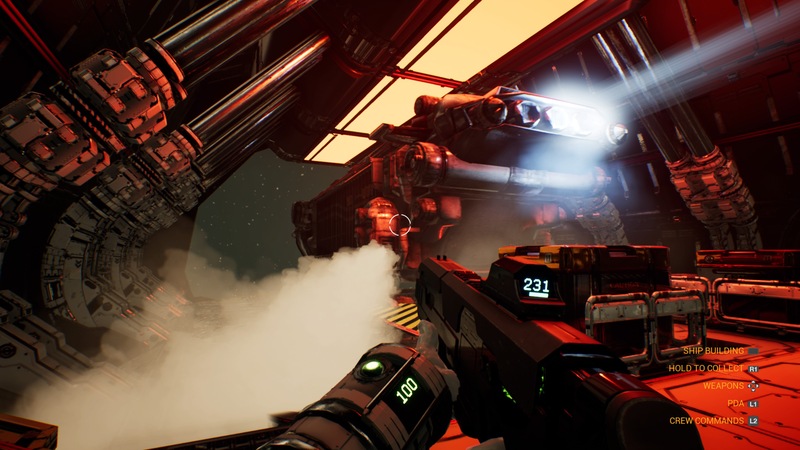 As for the weapons in Genesis Alpha One, from the rifle to the shotgun, blasters and further, they are all efficient. The problem is just making sure you’ve got enough ammo and, naturally, the resources to craft said ammo. This death always being caused by the myriad of alien species that are certainly inspired by sci-fi shows and films of the past. Whether the inspiration is from Headcrabs, the Goa’uld or the Predator, you’ll find it all here. Facing them off and killing them on a planet you’re visiting isn’t so much of a big problem. My normal move was to go for the sites – areas of interest from a crashed ship or something along those lines, which rewards you with artefacts. These can be new weapons, suit upgrades or other useful aspects. These, once uncovered, are also carried over to future games. What is a big problem with the aliens is when they land on your ship. I’ve personally never had any stowaways from the dropship when I’ve personally been to a planet, but without fail you’ll have some nasty critters visit you if just the AI go collecting resources. They can also be brought in using the tractor beam, seemingly being dormant aboard flying debris. 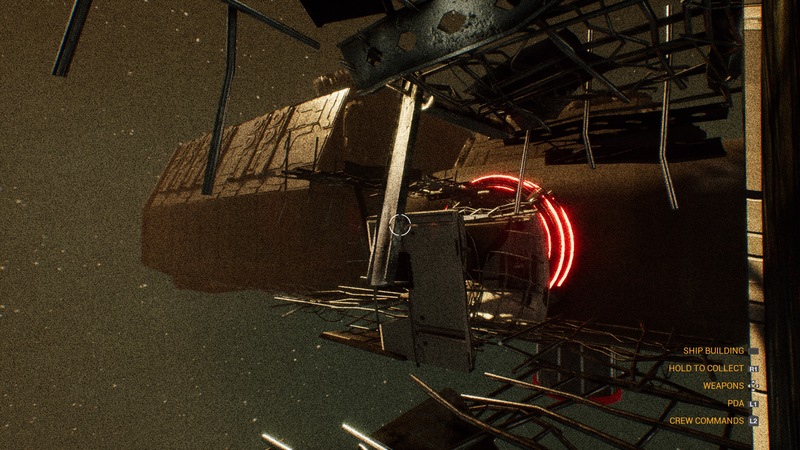 If they happen to get further into the ship, they’ll lay eggs and you’ll very quickly find yourself overwhelmed, listening to your crew members dying while parts of the ship quite literally being eaten away beneath your feet. This is another area you need to think about the structure of your spaceship. If it’s a long, winding, ship – you’re going to find yourself too slow to react to any intrusion. This doesn’t always come from alien stowaways either, with some races actively boarding your ship in an attempt to kill each and every member of the crew. Personally, I like to create as many bottlenecks as I possibly can between the areas of the ship you tend to get attacked from and the rest of it. Verticality is also your friend, with the ship having up to seven levels. Some structures do take up a number of these levels when built. Naturally, when it comes to dead crew members, you can just clone more. The cloning vats allow you to use collected biomass to clone humans and other species, provided you have collected enough genetic material. In addition to this, you can also include alien abilities in a clone, boosting their intelligence, combat skills or giving them something wholly unique. This is where you’ll eventually want to go with your crew, with a number of alien species to work with and a wide variety of skills to include. Fortunately, as you uncover and research more, you’ll have the option of carrying them over into future games and even start with some of these species. If there’s one thing I do have an issue with, it’s how slow each game of Genesis Alpha One is to start off with. Also, if you find yourself swarmed early on, you’re almost guaranteed to perish. For the slow beginnings, this is, to an extent, varied. As you play you can also unlock up to 11 corporations (12 if you include the tutorial), which impacts how many resources you start with. Regardless, you’re going to find it a challenge no matter how you play. I’m honestly looking forward to buying Genesis Alpha One on the PC and using Cheat Engine to let me play with as much freedom as I want. Also, it’ll let me put myself in a huge amount of danger and attempt to fend it off with at least a possibility of surviving. Another thing that may be of issue to some people is the lack of a true story. As with most roguelikes, the story is really what you make of it. However, there is something going on here. While you go artefact hunting, you may also find logs from a Major Tom (of course!). These will tell the story of Tom. How this story ends, I honestly don’t know – I’ve still yet to find some of the logs it seems. Personally, I don’t find that to be a huge concern. The fun of these games is the emergent storytelling that comes from the trials and tribulations, as well as the pleasant surprises you find on the way. Aesthetically, Genesis Alpha One isn’t a game you’re going to be handing out awards to. It’s not an ugly game (unless you look at your crew) and Radiation Blue has plainly made a conscious decision to look like older sci-fi shows and films. The older aesthetic also applies to the UI, especially when building, which looks like it could have been taken directly from a monitor on Battlestar Galactica. The best part is that it’s all very user-friendly and easy to work with. The aliens are fantastic to see too, watching a space worm crawl towards you as it tries to infect you or the spurt of goo as an alien Scorpion-thing hatches from its hive under your lounge. Also, and this is very important, every part of the ship you build, you can personally just walk in and start working there. Or shoot some intruding aliens. You’ll also need to rush there to try and repair any damage caused from the inside or outside, should you hit an asteroid belt or come into the vicinity of other natural hazards in space. Maybe, just maybe, you should have built that shield your ship so desperately needed. The fact that you can see everything and go everywhere on your ship really adds to the feeling of scale that the game offers. Of course, if a segment of the ship you’re in gets destroyed while you’re there, you’re in for a very quick death and a change of captains. If you’re not, you can actually go spacewalking on the rubble of that part of the ship. It’s a brilliant element that still allows for the connectivity of one part of your ship if the formerly connecting corridor gets turned into space-dust. It also acts as one of the tensest parts of Genesis Alpha One. One wrong step, one ill-timed jump, you’re going to be flying off into space and, of course, death. If there’s a way to summarise Genesis Alpha One, it’s hard. Very hard. It’s hard to get a good start, particularly if the game doesn’t put you near the resources you need. It’s almost impossible if you’re unlucky enough to get an early infestation. So much is luck based and I’m not lucky. Despite this, I genuinely love to play it. It’s one of the most unique and engaging roguelikes around. 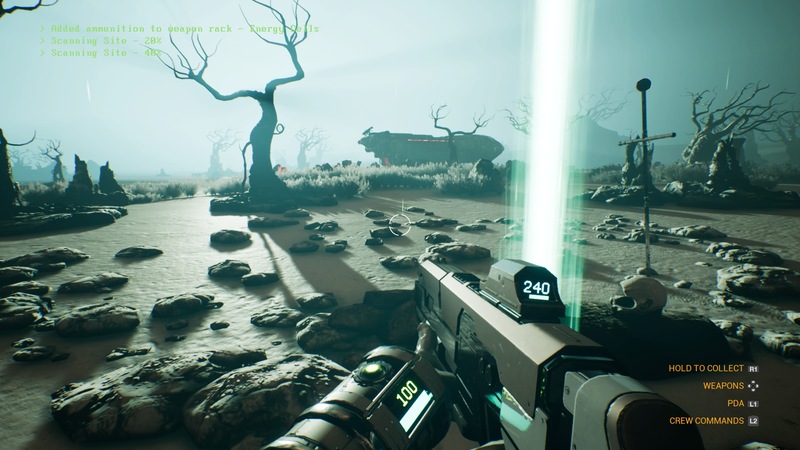 All in all, I genuinely think that Genesis Alpha One is a great game with even higher potential, should Radiation Blue look at expanding it with further story elements or new campaigns. PS4 version reviewed. Copy provided by the publisher.